As the title suggests windows time keeps changing in random times, with random amounts. It sometimes happens every minute, sometimes it is good for hours. If I go hit synchronize with Internet time, it updates to the correct time. Disable/Enable Internet time synchronization. No help. Disable/Enable windows time service. No help. CMOS battery is dead. No it is not dead. Time changes also do happen when windows is running. Your router/modem time is wrong and effecting windows time. No, it is not wrong. You are dual booting into Hackintosh/Linux. No only Win 7 runs on this PC. You have a dodgy overclocking. I did have a high OC profile, but tried running at stock speeds with no help. Virus/Trojan. I highly doubt it. This is a very bare Windows installation for gaming. Only windows and games with Steam are installed. I can confirm, this problem does not exist, when I start the windows in Safe Mode. I've tested this by booting into safe mode. After the boot, I corrected time manually and left the pc running for a couple of hours, and the time was not changed. I don't know how I missed this detail (or actually if it will help) but the time resets to "that" exact time. That exact time being the first updated time. This keeps happening, regardless of me changing the time or not. 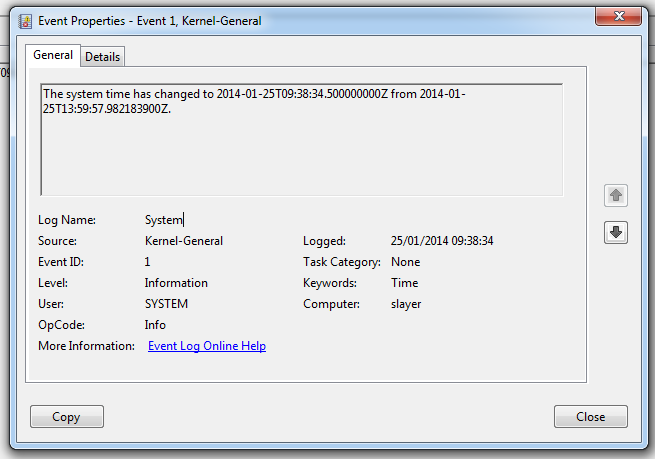 Here is a screenshot from Event viewer, about the time change. Keep in mind this screenshot is taken when the "Windows Time" service is disabled. Screenshot and the details kind of implies that, windows is really thinking that this is the correct time and feel the need to update it. Although no windows service is activated to authorize this. The problem was apparently not Windows or any other software trying to update the time. After reading the system memory dump for an hour I found out Windows was unable to read RTC from motherboard. After failing to read the RTC state for a while, Windows thinks it is calculating the time wrong and reverts to last know RTC state. Solution advised was: Flash your UEFI and reset CMOS on standby power. Since I knew I was already on a recent version UEFI, just resetting CMOS on standby worked for me. Everything works now without a problem. Thanks for all the input and sorry for misleading info about the problem, but I'll leave all the information posted above, hoping that it might else someone else. I found it around the Internet, but no source is available for me. I had the same problem in night hours, now - after this command - it is gone. System restart is required. Doubt this is the answer to this user's problem as they've fixed it as above. However there is a common cause of exactly these symptoms in dual boot Windows/Linux systems: the two OS treat the CMOS clock differently and fight over setting the clock the way they want (Linux to UTC doing daylight savings etc in software, Windows to local time so the software and hardware clocks are the same). This has a simple solution: tell one of them to use the other's default behaviour. Obviously don't do both of these! There are two types of this problem. The first one resets to the base date & time which for most modern computers is 2008. Even with internet time sync disabled there are software such as Nero burning rom and MSinstall exec that will try to set the time for an install or run. Older versions of dotnet will also do this and some games install these old versions hidden in background. A recent install of an older version of printshop did just that. I ran tracemon and it was traced back to the dotnet 1.x that printshop installed internally. Look at any older software gaming or otherwise you might have installed and look at the dotnet activity log as well. The is also a correlation with SSL or internet secure server that if the date is older than one month (windows 7 & 8) that it will also cause unauthorized time and date changes and windows security will go into auto lockout and set the time and date back to the minimal default to protect itself. Uninstall any third-party clock applications installed on your computer and check if that brings about any change in the clock timing. Let’s first check for the status of Windows Time and restart the same. check if that makes any difference. Click Start, type services.msc and hit ENTER. Have you check the timezone server value. it should be time.windows.com. Second option- i would suggest you to restart windows time service from services.msc. Do you have any third-party clock applications installed on your computer? If yes then please uninstall the application. If flashing doesn't work, it might be the cmos battery. I've never had that problem in all the computers I've owned for years, but several times I've had friends have to replace their cmos battery. It's tiny, like one inside a watch. Some are bigger/thinner like the cr2032s you get for a snark guitar tuner. Hope that helped. I'm hunting this one down on my computer too, but I recently started the additional problems of it constantly telling me I don't have enough memory in C: to run fairly simple apps and knowing I have a laptop battery that's worked its way down very close to 0 minutes of charge. I use this one plugged in at home all the time now and have a newer laptop I use everywhere else. Try creating a regular task to synchronize your time. Then you can set "Begin the Task" to "At log on"
Leave everything else unchecked except "Enabled"
The original post has a slightly different configuration (he suggests checking "At Startup" and "Repeat task every: 5 minutes"). Also, I had a small issue with being unable to change the trigger, so I exported the "ForceSynchronizeTime" task and then renamed it "FixClock" and imported the new task into the folder alongside the old one. I then edited the trigger for "FixClock". You might want to check your regional settings. Does Windows 7 have perhaps a bad UTC offset setting? Perhaps it is calculating the time incorrectly because of that. Check your Timezone and (less obviously) your Regional settings in Control Panel. Not the answer you're looking for? Browse other questions tagged windows-7 date-time clock or ask your own question. What could be causing Windows to randomly reset the system time to a random time? Is there any way to get correct system time without NTP?